Tires are among the most important components of any car, truck, or SUV. Keeping them in prime condition and replacing them when necessary will ensure the longevity of your vehicle and your safety on the road. Rotating your tires is important to ensure they wear evenly and last as long as safely possible. Due to the way we naturally drive, our front tires wear out on the outside edges more than anywhere else because of frequent turning. The rear tires, however, wear more evenly. 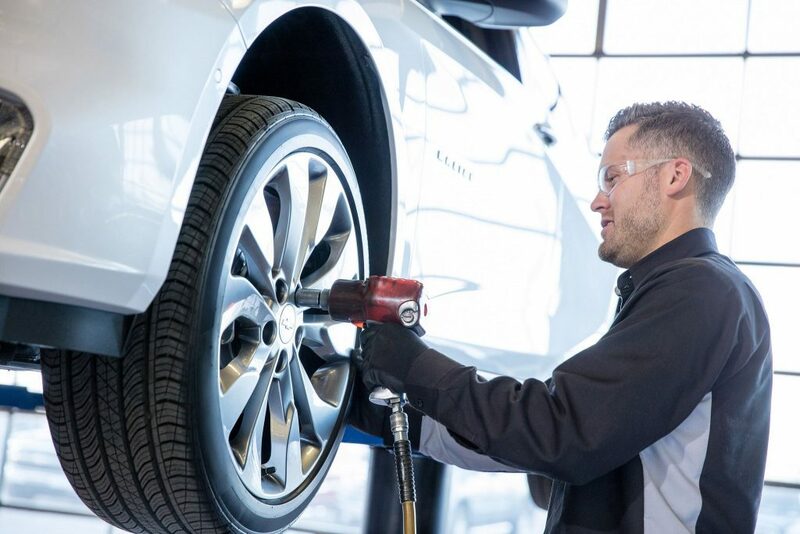 By rotating your tires with every oil change at Landmark Chevy, you can make sure that your tires are all exposed to the same wear patterns over time. When we are rotating your tires, we can also do an alignment check for you and even inflate your tires to their proper pressure levels. Speaking of tire pressure, it is important to keep your tires at their proper inflation. Both over-inflation and under-inflation can be dangerous. If you notice that you routinely lose tire pressure, it is possible there is a hole in your tire that you will need to patch—or you will need to replace the tire entirely. In the colder months, tires can lose pressure, so it is important to regularly check your tire pressure and inflate as necessary. Tread provides traction on the road so that you can more easily grip the pavement and stop when you need to. Over time, this tread will wear away, and you will need to replace your tires. You can use the famous penny test to check the tread depth of your tires, but our service technicians will always alert you of your current tread depth with every maintenance visit. Have questions about your tires? Schedule a service appointment at Landmark Chevrolet.